We both come from farming families, Sandi (nee Crockford) from arable/beef and Steve from dairy/arable/game rearing. 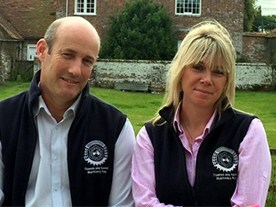 We have formed our own Ltd Management Company and through this manage the Machinery Ring, ongoing amenity maintenance contracts and some farm secretarial and HR contracts (outside the Ring). We met through Berkshire Young Farmers, and have lived in the village of Great Shefford, for the past 22 years. 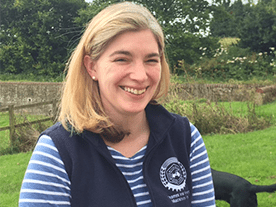 We have three children all of whom are involved in Young Farmers Organisation and we are both still involved too with the Young Farmers, serving on the Advisory committee of our local club, with Steve also sitting on the Berkshire Executive committee. Steve is a Parish Councillor in Great Shefford and Sandi ex parish clerk of several years. Sandi’s background was initially in the hotel/hospitality/ conference/wedding sector followed by 10 years in telecommunications industry, she was working part time for the Ring for two years before becoming Manager, Steve has been working in the agricultural industry for the past 30 years and has experience in dairy, arable, game farming, amenity work and agricultural HGV low loader work and enjoys shooting and land rovers! Camilla graduated from the Royal Agricultural College with a degree in Property Agency and Marketing and went straight into Estate Agency. She has worked for a few agents over the last 10 years, the latest being Humberts, which she left in 2013, to have a baby. She is married to Andrew West, who is an agricultural farm contractor and have a son. She joined TKMR in 2015 to help with the administration on a part time basis. Outside the Ring she enjoys cookery, sport and travelling. Michael was born and bred in the Newbury, Reading area, and as many of us were, he was a junior and senior Young Farmers Club member. As a teenager, he enjoyed playing rugby, cricket and tennis. Michael was agriculture contracting for 26 years in the Newbury area. In June 1991 at its inception he was offered the part-time management of the Ring and as expected it soon developed into a full-time occupation. Michael retired from full-time work in December 2012 but continues working part time supporting management team at the Ring. He now enjoys the garden, walking the dogs and watching the sports he once played. Tom joined the Board of Thames & Kennet Machinery Ring Ltd in 1999 and became Chairman in 2005. Since then he has worked with the Ring Manager and other Board Members to increase the level of service and opportunities the Ring offers its members – he is very aware that as a business the Ring is allowed to develop and by doing so should make itself more attractive to New Members. Tom comes from a farming/farm management background. In the early 1990’s he was given the opportunity to start his own largely agricultural related services business, which over the last 20 years has diversified to cover a wide range of activities, employing 3 full time and part-time staff. Tom is married to Geraldine – they have a young family and live in Micheldever near Winchester. 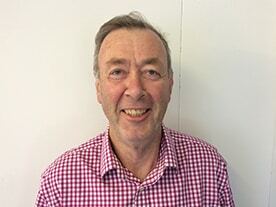 Geoff has been a Machinery Ring member for over twenty years, and a director since 2004. Since a career change to agriculture in his late twenties, Geoff has worked his way through tractor driving, farm and estate management, and farming in partnership. He now farms some 3700 acres of arable crops from his base at Micheldever Station, on a mixture of Farm Business Tenancies, contract-farming agreements and stubble-to-stubble agreements. The land is in fourteen blocks, for nine landowners, stretching from Stockbridge to Thatcham, so logistic skill, enthusiasm and a sense of humour all play major parts in offering a quality service. While most ground is min-tilled, rotational ploughing and thoughtful rotations still provide the backbone of sustainable and profitable crops. Johnny left Berkshire College of Agriculture and went home to the family farm and went started hiring portable driers, at one time having five in operation, however the driers were replaced by contract spraying. On giving up the tenancy at Upper Farm, Farnborough Johnny, Heather, Alan and Michael moved to Beedon, where they erected a purpose built barn to house the contract spraying and amenity groundcare equipment, the boys joining the business of J Cantlay & Sons – Michael carrying out most of the ground care work whilst Johnny and Alan concentrated on building the haulage business, when Johnny was forced to retire from the spraying due to allergies. Over the last 5 years they have built up a successful gritting business round for industrial sites, based mainly in Oxfordshire. Johnny’s hobbies have included photography and competitive safari racing. He has been a Ring member since its inception and in the past has helped with the accounts and IT when required. Ben farms with his father at Avebury, near Marlborough on a 1000 acre mixed unit, comprising of arable, a single suckler Aberdeen Angus beef herd and sheep. In addition 900 acres are contract farmed and rented under three different agreements. Before returning to the farm, he worked as an Agricultural Business Consultant for Savills in Salisbury. Stephen is a fourth generation tenant farmer and farms 1,400 acres of rented, contracted and owned land near Henley. A beef finishing enterprise is run alongside the main arable business. Before returning home to join the family partnership in 2009, he worked as a farm manager for the Co-op Farms in Yorkshire. Stephen joined the Board of Directors in 2014, continuing a long family involvement with TKMR and he is keen to create further opportunities for our members. Derek comes from three generations of farmers who farmed in Fawley, Nr Henley-on-Thames for over one hundred years. On leaving school at fifteen years of age, Derek was employed by the owners of Fawley Estate as a trainee caring for a herd of pedigree Aberdeen Angus cattle. Derek soon learned that this was not the route for him & moved onto operating farm machinery. By the time he left, some twenty years later, he was farm manager. In 1995 Derek started his own business DRC Contracting & began crop spraying and spreading across Oxfordshire, Berkshire, Hampshire. Derek has ben a ring member for the past twenty two years. Kevin lives in Oxfordshire with his partner Louise. He attended Berkshire College of Agriculture where he studied agriculture. Over 15 years ago Kevin established Pasture Care which he owns and manages. Pasture Care was originally established to look after the needs of the small equestrian establishment and despite expansion into other areas, this still forms a valuable part of the business. The business has progressed naturally into agriculture, which has now become the mainstay of the business. Whole farm contracting is something he is very passionate about, but he also offers general contracting services including drilling, tree shearing, hedge cutting and hay making, to make but a few. Outside work Kevin enjoys shooting.